AB Testing is a method that used to determine which Email campaign version performs better and more efficient. With AB testing campaigns you can test up to 8 different versions of your mailing campaign and check, before sending mail to your mailing list, which is the efficient version. How to create AB testing campaign? 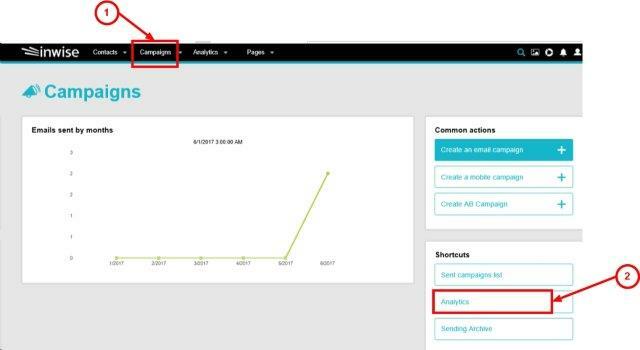 Log on, and in the main screen choose Campaigns > Create AB Campaign. Now define the testing criteria. In the following example we test 2 subject lines and 2 bodies (contents). This combination will open 4 different versions for the campaign: 2 content versions will send under 2 different subject lines. After choosing the test criteria, we’ll define Test Segment under Split Rate. The test segment is a group from your contact group that will get the campaign (AB campaign will sent to only one group of contact). You can define the test segment by yourself. In the example, we set 20% test segment, meaning each contact will get one version out of four versions of the campaign. After sending the campaign to your test group (the 20%), the winning version will sent to the rest of 80% of your contacts. 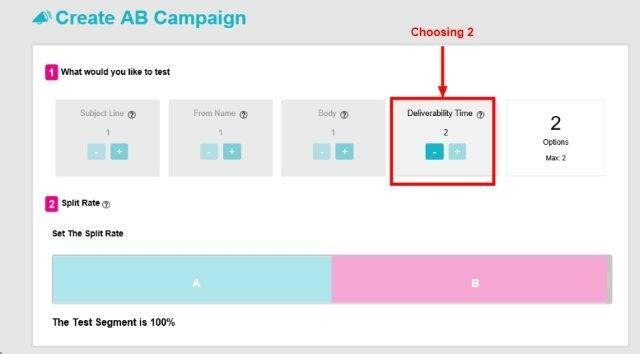 Another option for testing is sending the campaign in 2 different times, so you can test the optimal day and time to send your future campaigns. In this option, the system will send the campaign to 50% of your contact in one time, and the rest 50% in another time. In that option, you will not allowed to choose other criteria and not to set test segment. The results we’ll get will let to choose the best time to send campaigns on your next sending. Open rate or Click rate – the version will be sent to your contacts automatically according to the time definition. Testing time – you can choose the days or the hours that the version will test till sending the winning version. After the system has made the first mailing and set the winning version, it will send the winning version to the rest of your contacts from the group (in our case, the rest of 80% of contacts). Manually – System will not send the campaign automatically, the user must choose the version according to the click rate or open rate. Also, user must set the time the winning version will send (days or hours after campaign has been sent). Click next at the bottom right corner of the screen. Fill the subject lines you want to test. In the Campaign name (internal), fill the Campaign name that will appear in the system. This is for internal use only. Click next and you’ll get to Campaign body. Click on Campaign Body #1 and edit the first campaign. 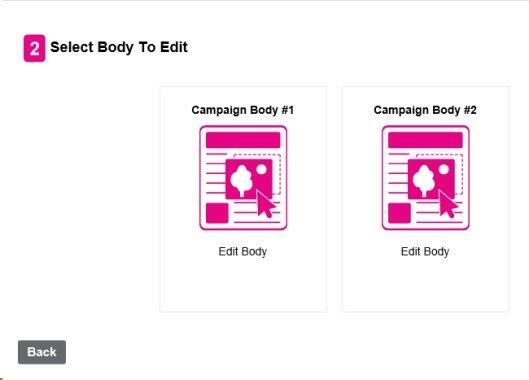 After you done and click Next, you’ll back to the Campaign Body editor again and you can choose the Campaign Body #2. After you done, you’ll have to continue the sending process, same as regular Campaign. At the top of the screen click on Campaigns and then Analytics on the right of the page. You can see the campaign statistics which sent to the contacts. In order to see all statistics of each campaign click Results comparison. In that page you can see statistics of each version that has been sent. In order to choose the winning version, click on “Set as the Winner”. Now the system will send the winning version for the rest of the contacts, in our case 80%. After determine the winner, the system will send the campaign to the rest of the group contacts whom the campaign didn’t send to them.